Finally, all caught up with dentist appointments. Time to head west. We know we are running out of Corps parks the further west we go. There are two more in Texas heading west on our route. The first is Rocky Creek on Somerville Lake near Bryan and College Station, Texas. There are two in New Mexico and none in Arizona. Luckily, there are more in the western and northern states. If you are not familiar with College Station, think Texas A&M University---50,000 students, 10,000 graduate students, Oh---and also a heck of a football team. Another beautiful Corps park with lots of space between the sites. 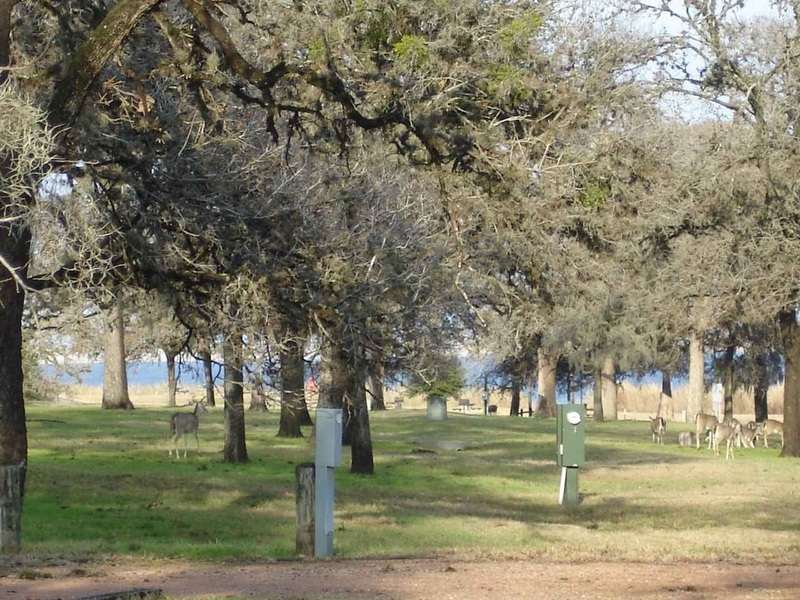 Another thing we have enjoyed about these Texas Corps of Engineer parks in that there is usually a section or two set aside for those who do not have reservations. So, if you find an empty site, it's yours. This is the feel of the park. 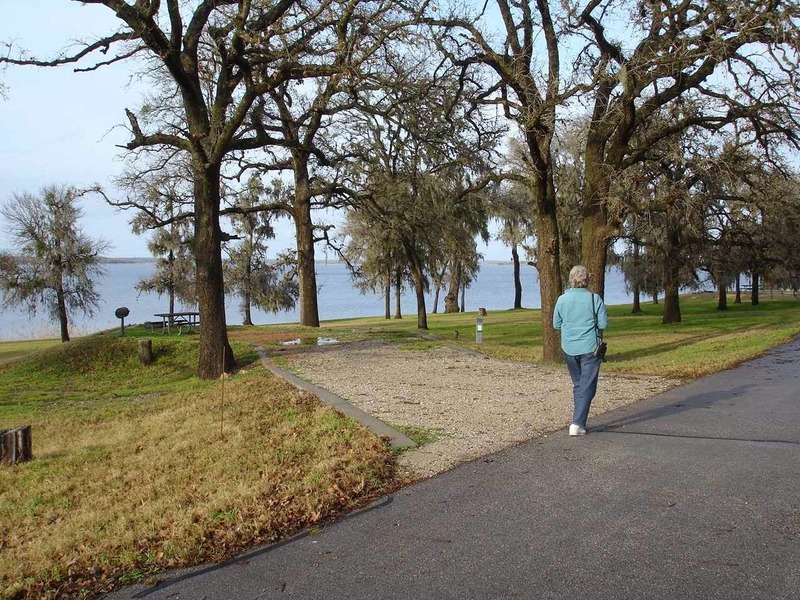 A large, well kept park, with lots of open spaces. By the way ,can you see Lady Blue? As we get older -------oops---as I get older, somehow the simple things are enjoyed. 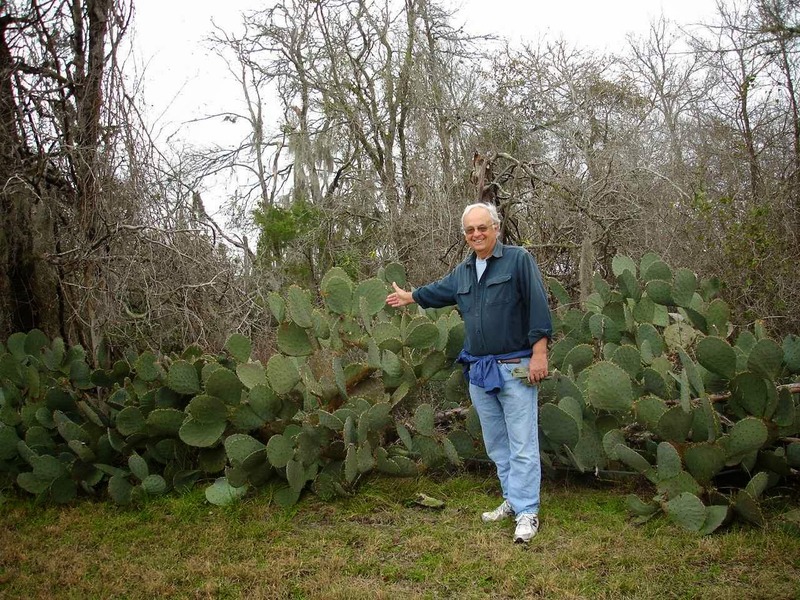 There was something here that was nice about seeing the large prickly pear cactus again. It doesn't take much to please some people!!?? Rocky Creek is home to a number of animals. There is a fairly large herd of deer. We saw at least thirty at one time. Seems like some campers may be feeding them. Also a number of birds and some armadillos. On the way in, we had to stop for about 6 or 7 wild pigs-----very big wild pigs----crossing the road. No camera available!!! You may have noticed a large puddle of water in our second picture of this post. 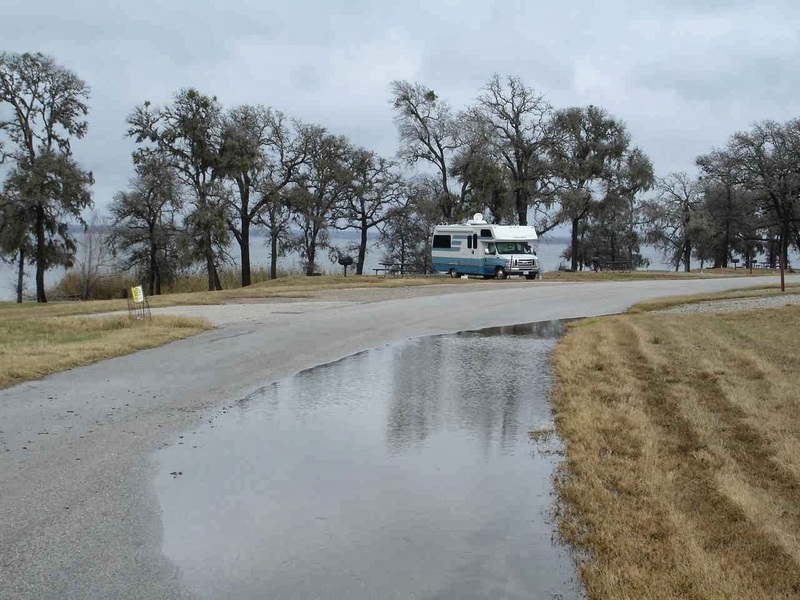 Most of our stay at Rocky Creek was rainy, as were most of days we have been in Texas. Things to remember as we head into very dry desert country. This is just another typical Corps campsite. All sites have electric and water in this section. 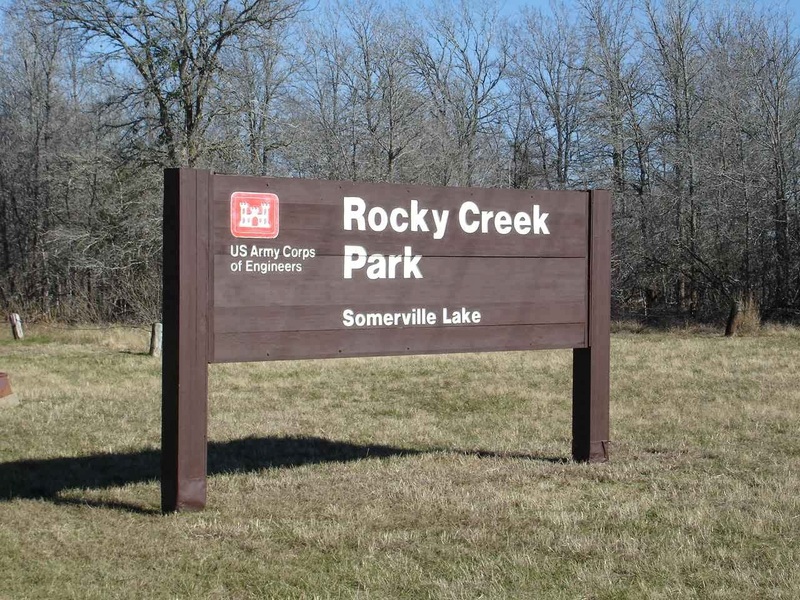 Most Corps parks do not offer a sewer hookup. And some Corps parks will have a dry camping section--no hookups--for even less than this $13 per night with the senior pass. 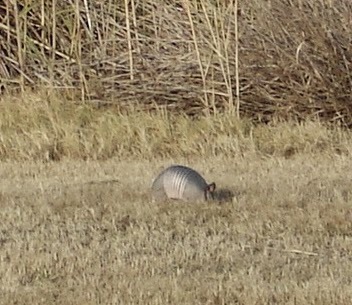 When we see armadillos, we are often on the highway or on a road with no possibility of stopping for a picture. This one was on our walk in Rocky Creek. He was near the high grass, so I had to try a telephoto on our pocket camera. There used to be many of these that we would see in Grandpa's town--Englewood, Florida. But , they pretty much disappeared with increased development and population. The deer blend in so well. We would be walking on the road and would have to stop and stare into the woods until our eyes could pick out the different deer. Even then, we probably would have missed them except for the white tails that would pop up as we went by. 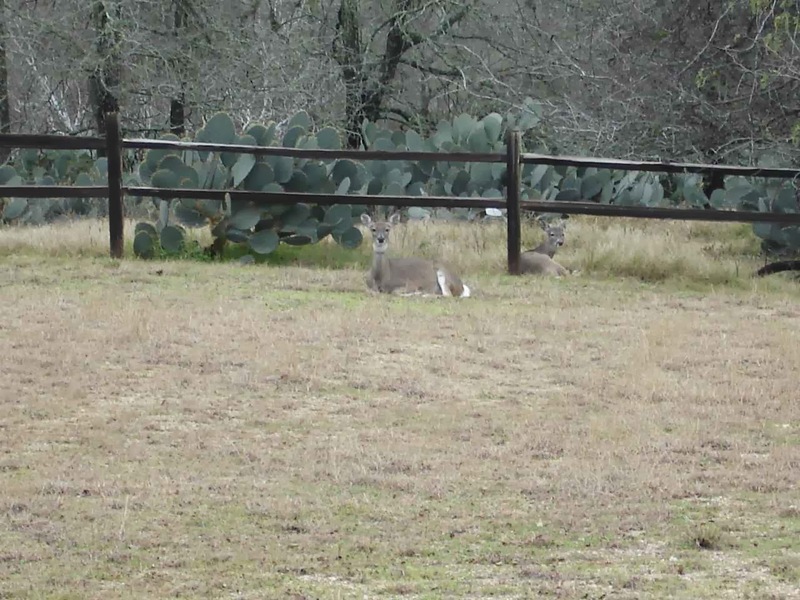 The deer on the left is a buck with 6 points on his antlers. Sorry, but I couldn't resist adding this picture just in case you couldn't see Lady Blue in the earlier picture. Jan and I didn't have to go far to watch the deer. They came by the back of our motorhome each night at dusk. This picture was from our back window. Finally , on the morning we left, there was a clear, sunny view from Lady Blue to the other side of Somerville Lake. Another of those random thoughts---------when we have a wonderful view like this---I will sometimes also note that this wonderful view comes with no lawn mowing or raking. 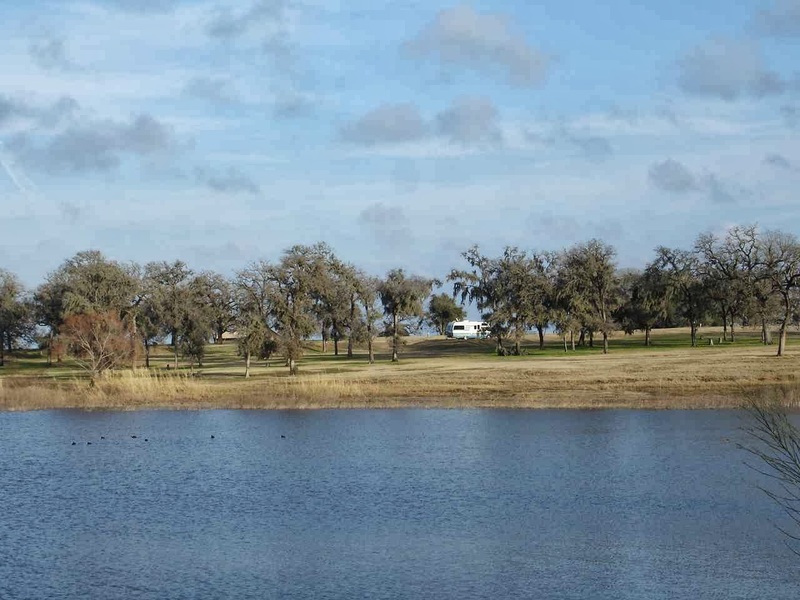 A beautiful sunny day takes us to Potter's Creek Park at Canyon lake. 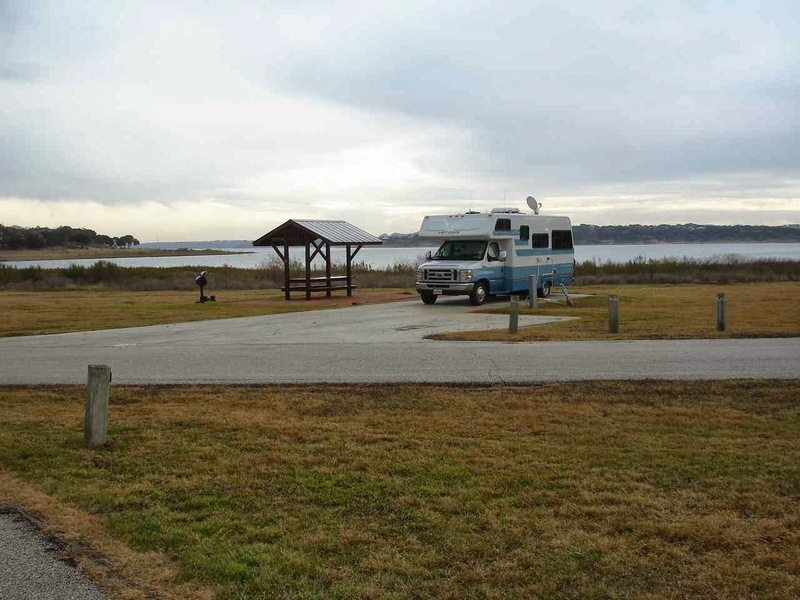 This park is in the Texas Hill Country just north of San Antonio and a little south and west of Austin. There are many great day trips that would be possible from this park. There are many more boaters at this park and in this lake. Keith might like to know that they closed part of the park. A temporary closing because they had too many deer. 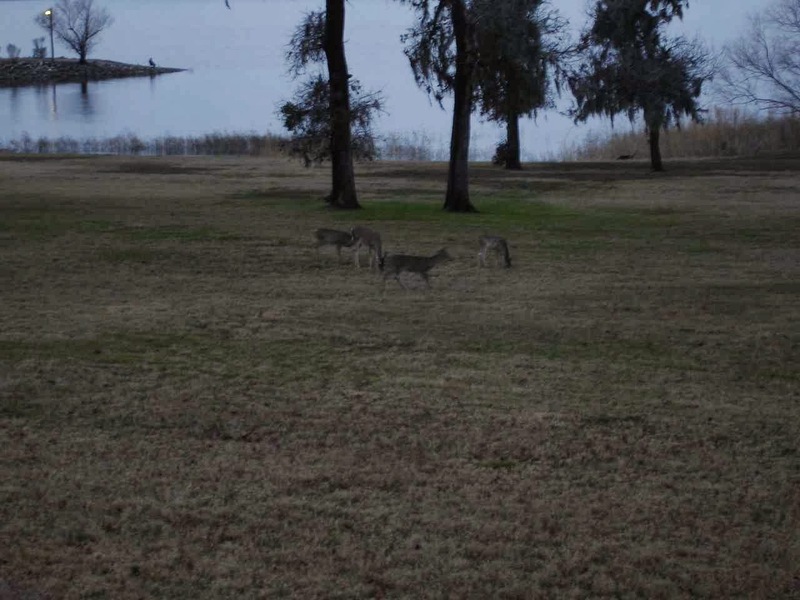 The sections were closed for hunting to cull about 130 deer from the local population. Still plenty of sites in three large loops. Ans yes, it rained again today. 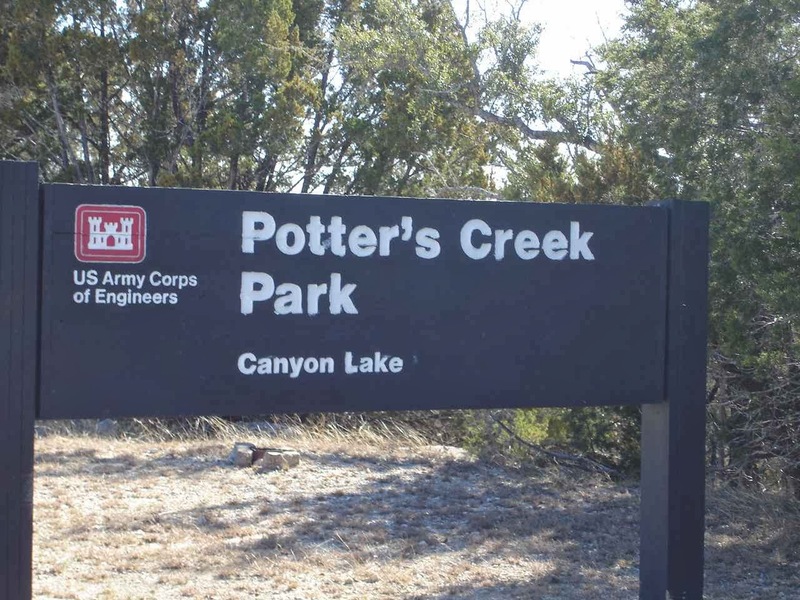 We tried to get a site at Crane Mill at Canyon Lake at the end of December but all sites there and Potters Creek were taken. We hope to try again in February. Looks like a nice place to stay. Look forward to info on the one in NM.